Beautiful blue glass bottle with cork, tied with sari silk and a dragon charm. Bottle with cork measures approximately 5 inches tall. Exact bottle style may vary from that shown. This blend of 12 herbs mixed with sea salt was created for use in draconic workings involving prosperity, wealth, boldness, confidence, self-exploration, transformation, new beginnings, protection, and communication. Use with crystals or other witchcraft tools of your choice. To use as an offering for the Dragon, place a small amount of herbs in a small container, or wrap in cloth and place on your altar. You may also place the whole bottle on the altar if you so desire. Burn a small amount during meditation to help open communication with the Dragon. 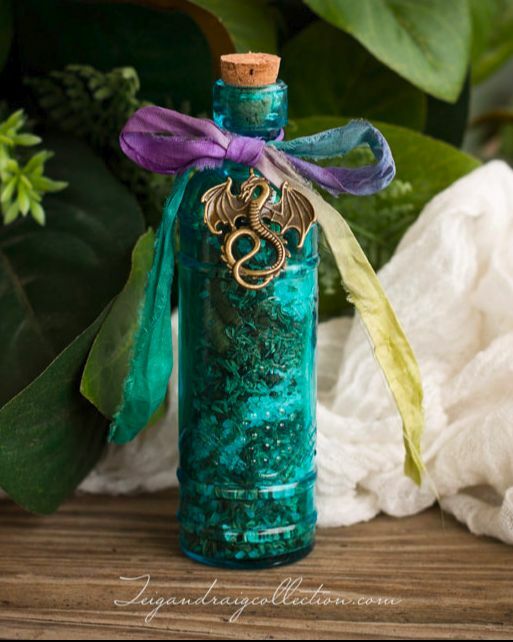 Anoint a spell candle with Dragon Wings Conjure Oil, then roll anointed candle in Dragon Herbs. Add a tablespoon to ritual bath water before performing your draconic workings. There are many more possible uses for Dragon Herbs. Use your intuition and let it guide you. These herbs have been cleansed and blessed with draconic energy and are ready for use how you see fit.